Mickey's Very Merry Christmas Parade at the Magic Kingdom. The Christmas holidays are a very special time at Walt Disney World, filled with special events in and around each of the four theme parks. Magic Kingdom is host to the Mickey’s Very Merry Christmas Party featuring Mickey’s Once Upon a Christmastime Parade. This is a hard-ticket event held only on certain dates. 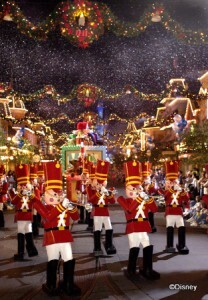 You’ll need theme park admission plus your ticket to gin entrance into this special event, where you can sip on cocoa and much on Christmas cookies, take in the parade with Santa himself, see the special Wishes holiday fireworks, meet and greet with characters, take in special shows, and much more. Every year, part of the “Disney Parks Christmas Day Parade” is taped at Magic Kingdom a few weeks prior to Christmas. Either go and enjoy, or stay away to avoid the crowds! Click here for info and prices for Mickey’s Very Merry Christmas Party. Epcot plays host to the Candlelight Processional, held at the American Gardens Theatre three times nightly. The story of Christmas unfolds daily during this event featuring various celebrity narrators, a mass choir and 50-piece live orchestra. While no extra tickets are needed for this event, you may want to book a special Candlelight Processional Dinner Package to ensure a good viewing location. Holidays Around the World is another special Epcot event, where you can hear local holiday customs and folklore from around the world. Cap it all off with a special Holiday IllumiNations show. Hollywood Studios is home of the Osborne Family Spectacle of Lights. There’s a special story behind the event’s origins – as all the lights were originally shipped in from an enthusiastic Arkansas family – the Osbornes! Millions of lights twinkle and delight every night from Nov. 8 through Jan. 3. It’s not to be missed! Animal Kingdom is home to the Mickey’s Jingle Jungle Parade and Santa Goofy’s Holiday Village. Both of these are included with park admission. And finally, Downtown Disney is home to Festival of the Seasons, where you can pose for photos with Santa himself! Click here for info about all of the special holiday events for 2010, including dates and ticket info! Aside from special events at the theme parks, you can also check out beautiful holiday decorations at the resorts! The Contemporary Resort, the Grand Floridian Resort, Animal Kingdom Lodge, Wilderness Lodge and all the rest are always decked out in their holiday finery. Some even have beautiful gingerbread house displays. This is a great no-cost way to enjoy some holiday cheer, even if you don’t have theme park tickets! And who can forget special holidays treats? Only during Christmas time can you get special treats like holiday-flavored fudge, homemade candy canes, and special cookies, brownies, chocolates and more! Click here to see what you can expect. Several Disney restaurants also serve special holiday menus. Click here to see some top picks for special holidays meals at Disney World. We hope you have a wonderful time during the magical Christmas holidays at Disney World! This post is part of the DisMarks Disney Blog Carnival! Check it out for more great Disney-related content and information. This entry was posted on Saturday, September 4th, 2010 at 2:02 pm	and is filed under Planning, Theme Parks, Uncategorized. You can follow any responses to this entry through the RSS 2.0 feed. You can leave a response, or trackback from your own site. Maybe a little off topic, however, With 4 children and two adults, I am confused as to which Disney world holiday option offers better value for money; fly drive villa rental or package holiday staying in a Disney hotel. I’d appreciate opinions from people who’ve either both option from the UK.